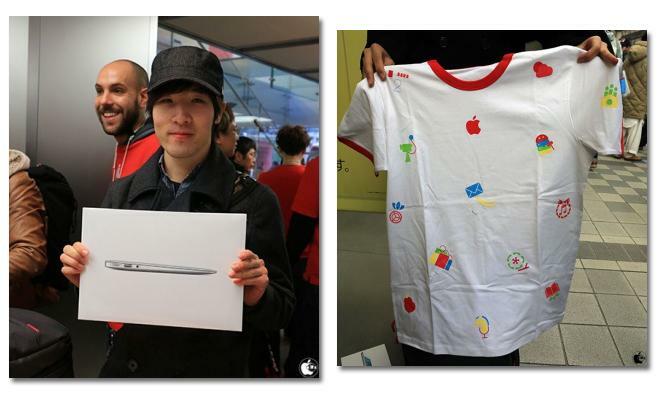 For its annual New Year's Fukubukuro "lucky bag" promotion in Japan, Apple gave away products valued much higher than the package's $340 cost, with 2014's special gifts including 11-inch MacBook Airs, iPads and iPods. Apple had four different Fukubukuro configurations —roughly translated to "lucky bags" —awaiting customers this year, each selling for 36,000 yen, or around $340, reports Japanese language publication Mac Otakara. While every bundle represented some sort of savings, the biggest came with bags containing an 11-inch MacBook Air, Apple Magic Mouse, Pill Speaker by Beats, red MacBook Air jacket, special New Year's Apple shirt and other small items. The three other "big surprise" gifts included Wi-Fi versions of the iPad Air and first-generation iPad mini, and seventh-generation iPod nanos. Alongside Apple-made accessories like Smart Covers, the company also stuffed bags with the Philips hue starter kit, Nike+ FuelBand SE, Ultimate Ears Mobile Boombox, Stem IZON View remote control camera and Square's credit card reader. Apple's annual Fukubukuro promotion was announced on Dec. 26 alongside a one-day sale for the Online Apple Store and Apple Store iOS app in Japan. As of Jan. 3, Apple Stores in Japan will also be conducting a three-day series of free kids workshops geared toward digital content creation on the iPad. The sessions will involve music, movie and photo journal projects likely created with first-party iLife apps.